Thanks to everybody who came out to see the concerts played by Asmus Tietchens in France and Belgium. We had a great little tour together, bringing the Tietchens sound for the first time ever to France. 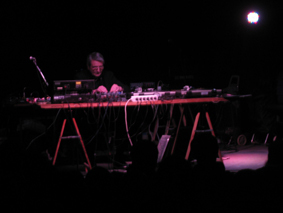 The picture shows Asmus at work in the concert in Montreuil/Paris on November 25th 2010 at the beautiful Instants Chavires. Thanks to all the organizers in Paris, Toulouse, Marseille and Brussels, we had a great time!